Difficulty of the tutorial isn’t much hard but if you are a true enthusiast and have some creativity in the blood then you can surely make a cool looking graphic which may look best to the visitors of the page. Fire-up the Photoshop! I am using the Photoshop CS6 in this case. Go to the “File>New” there set the following dimensions for the new image to be developed. Just Hit “OK” after setting up the dimensions. You’ll get your painting board I means 😉 that front of the blank image which you are going to make as Facebook Cover. Note: In below step, Images are searched out using Google Images, which if not followed in right way may cause you problems legally. Using Google please get those images which are under the creative commons license, instead of downloading copyrighted content and using that in your project. So take care while choosing images, be sure that you give the author of images the right credit. 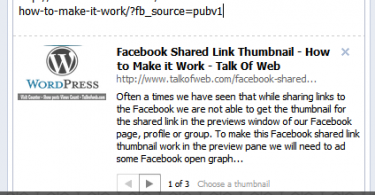 1- Fire up Google Images and make a basic image of the Facebook Cover in the mind which may suit the theme of the page. That image should be in sense of some keywords which may comply with the theme of your page. 2- Lets, suppose you deliver some fun content to the visitors, then you should have following keywords in mind like “Fun, Enjoy, Funny Images” and all that stuff like this. You’ll just put these keywords in the search box and then Hit the “Search” button. 2- You will need to re-size the image to match the canvas size i-e 852 x 351 for this purpose press “ctrl+t“. Resize the image as required by using the controls. 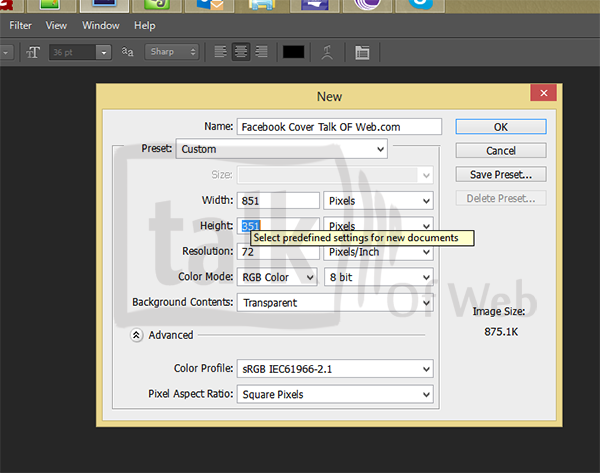 3- After you are done with resizing the image using the controls given by dragging and dropping then just press enter. 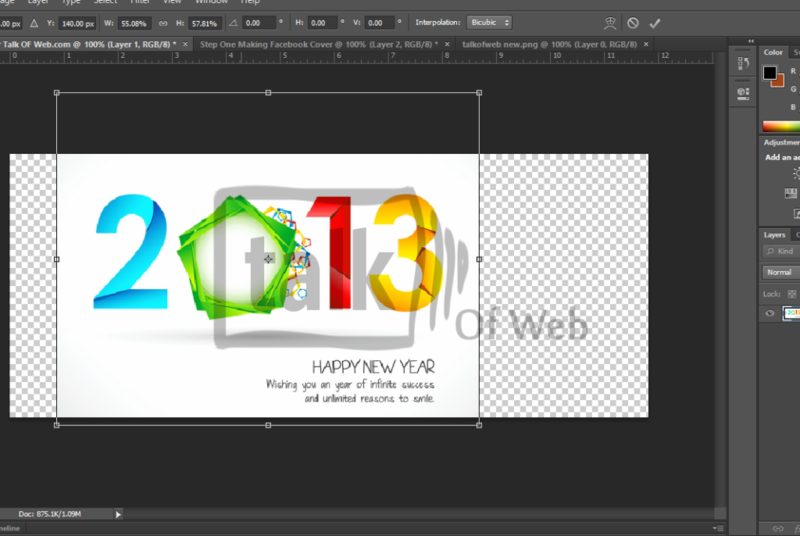 You are done, in my case I am trying to make a New Year Facebook Cover. 1- Download them and then to use them in photoshop simply add them to “C:/windows/fonts” by copy pasting over there. Now, you will need to refresh the fonts list of Photoshop. 3- Toggle the Character or Paragraph Panel by clicking the button mentioned as step 2. 4- Click on the small drop down button at the menu which appears and then click on the “Reset Character” button. 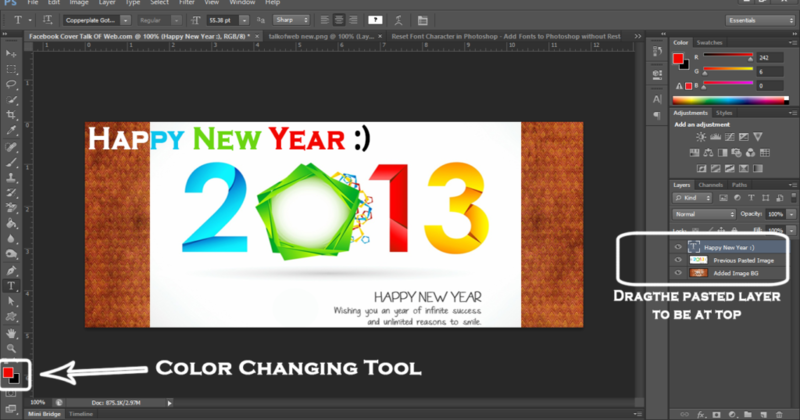 6- Write Down the heading, Like I did “Wishing you Happiest New Year” You can also make the font size smaller or larger by using the font size in upper toolbar of photoshop. You will need to reposition the background pasted image and also the written font, So lets learn some basics. You will have to select the layer which you need to reposition, When you paste the image, you can see the background layer as the pasted image and when you write some text you can see the “layer of the text” at the bottom right side of the photoshop. 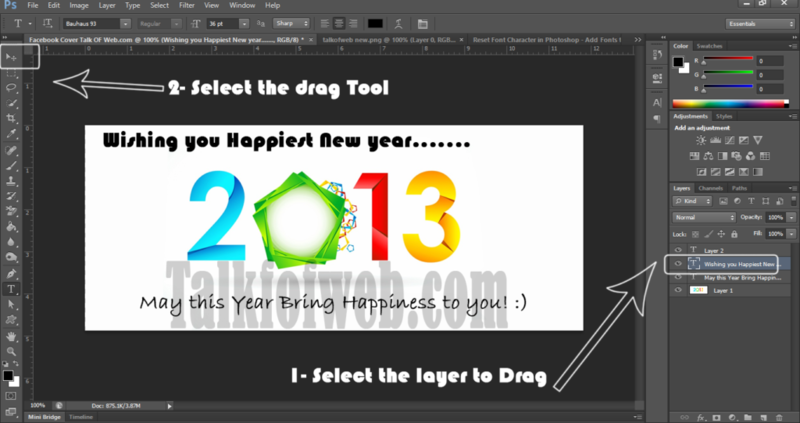 1- Select the layer to be dragged in the photoshop and then hit the drag tool. Then click on the layer in the image and drag that, you will be able to move it now. 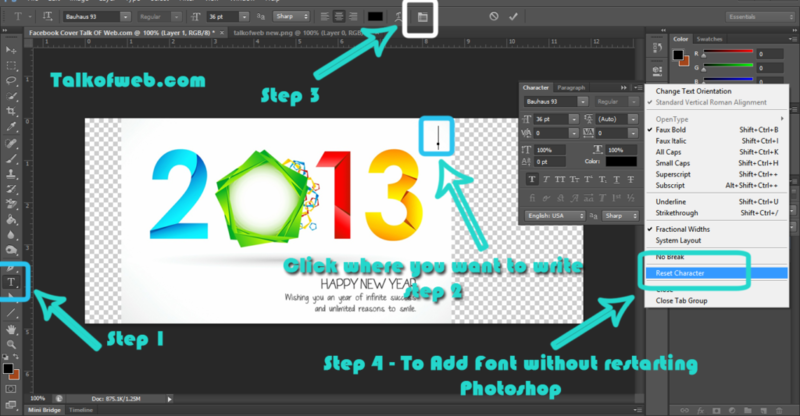 2- You can reposition any layer created in the photoshop. Using these simple techniques you can write what every you want in the photoshop with the best matching fonts. You can totally change the look of the Banner created so far by using some 3D fonts. 1- You can surely change the white background to some really cool looking pattern. For Doing this open any image which has a pattern background in the photoshop under the same tab in which you are making the Facebook Banner. 2- The opened image will overlap the pasted image from the Google, Don’t worry select the layer of the pasted image and drag that to make it above the opened image layer in the list of layers. The pasted image will appear above the opened image. Press “Ctrl+t” again to re-size the pasted image from Google and make it appear like the given screen shot. 3- Write the font in a new style and try to change the colors for the specific letters by selecting them and hitting the color pallet and pressing the ok for new colors selected. 4- Look something really cool is there, by adding a new image at the background and then repositiong the pasted layer to make a new banner. You can also add the URL of the other pages like twitter, Google plus, Youtube and all that Stuff. It’s up to you that how much you are creative to design any best looking image. Articles like this should not be encouraging readers to just go to Google to find images, save and use in their work without mentioning that most of the images you find on the Web are copyrighted and such use is illegal without permission. Photographers and designers often use software that scans the web for unlicensed usages of their images and they may sue if they find you using them without permission (as happened to a friend of mine a couple of year ago) even if it is non-commercial or amateur use. Instead, readers should be encouraged to find openly licensed images. Google has an option to search for these (see https://support.google.com/websearch/answer/29508) and you can also use http://search.creativecommons.org. Bbe sure to comply with any conditions of use that exist for any such images such as linking back to the original copyright owner. This recommendation should be standard practice by anyone writing about designing on the web out of respect for their professional colleagues’ rights and concern for their readers legal standing. Thankyou for the update Mark. I have added your note in post!